CSA Member Guest Blogger: Sunday Visit To The Farm! Posted 7/24/2016 10:03am by Elaine L. Lemmon. Happy Sunday, Everyone! This is Everblossom Share Member Deanna taking over the blog today. Summer is in full swing here on the farm. It’s blue skies all around, and this abundant sunshine is doing wonders for the crops - we’re all in for a treat! While we may not love the heat too much, the tomatoes surely do. Who’s ready for cool cucumbers and golden colored sweet carrots? Yeah, you are. 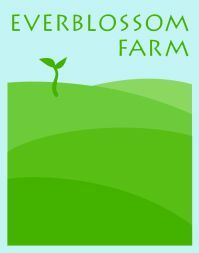 The Everblossom crew works incredibly hard to bring these amazing ingredients to your table. This hot, dry weather creates some challenges for farmers, namely when the rain doesn’t seem to cry from the sky and drought sets in. The team here is resilient, working around the clock to irrigate during the evenings and nights once the blazing sun disappears. As a result of their determination, rows and rows of vegetable candy as far as the eye can see. I’ve been enjoying all these goodies this summer and I’d like to pause for just a moment and express my personal gratitude and give a round of applause to this impressive farm. There’s something special about the pace of summer. The heat forces us to slow down and I’d like to think that our senses become heightened during this season. The aroma of basil, the campfire smoke that lingers in the air and sticks to our cotton t-shirts, the feel of delicate raspberries in the palm of our hands, the burnt orange and crimson of summer tomatoes, and the entirety of this seasonal taste lingering on our palates. Folks, I hope you’re soaking it all up! If for some reason you grow tired of eating these ruby jeweled candies straight from the container, scones are a great addition to those weekend brunches with friends and family. Who needs flowers when you have bouquets of thick, brilliantly green basil leaves? Add a little sunset color to your salads with these beautiful tomatoes! Also, just a reminder to stay hydrated out there during this summer heat. Melons are coming....you can do this!